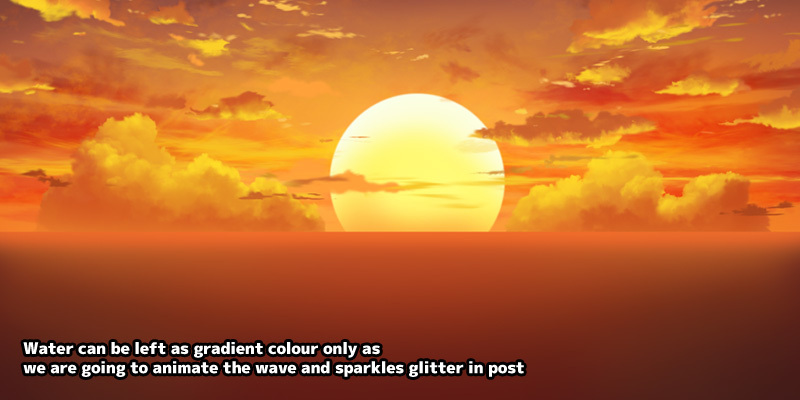 This is a short tutorial on animating anime style water wave and sparkle glitter using AfterEffects. 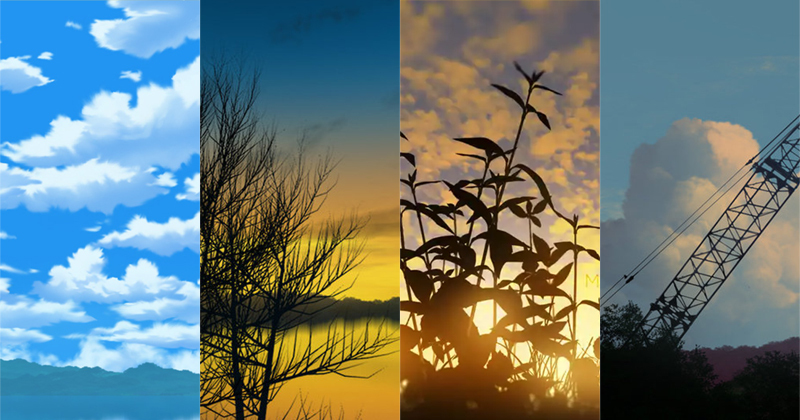 This tutorial will be using sunset seaside theme but the animation method can be apply in other settings such as a bright sunny day near a lake or river. Paint the background plate normally but leave the sea water without any details since we will be animating the waves and glitter later. Pay attention on the gradient of the sea color. Look at how the area near to the sun is in brighter colour while the corners are in darker shade. Water wave effect can be achieve using procedural cloud texture. Fractal / Noise Type - Leave this as default but you can experiment with other type. Transform - Disable "Uniform Scaling" and and stretch the noise horizontally. Offset Turbulence - Offset the texture. Animating the offset value give the impression of moving water. Evolution - You must animate this value for the noise animation, else it will stay static. 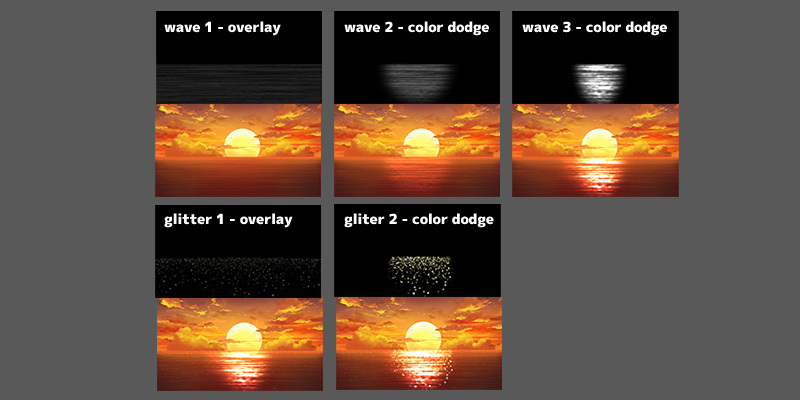 Remember to use "Corner Pin" filter to stretch the texture to match the horizon. Glitter effect can be achieve using a particle system emit only on a flat axis. Set particle emitter to emit in two axis, the water level. Birth Rate - How many particles. Longevity - How long particles stay. Position XYZ - Position of Emitter. Radius XYZ - Emitter zone, set it so it appear flat. In this case, Y radius is set to 0. Velocity - No veloctity or a very small value so the particle move in a direction slowly. Gravity - No gravity or a very small value so the particle move in a direction slowly. Particle Type - "Star" work the best, you can use "cube" too. Birth / Death Size - Use a small value. 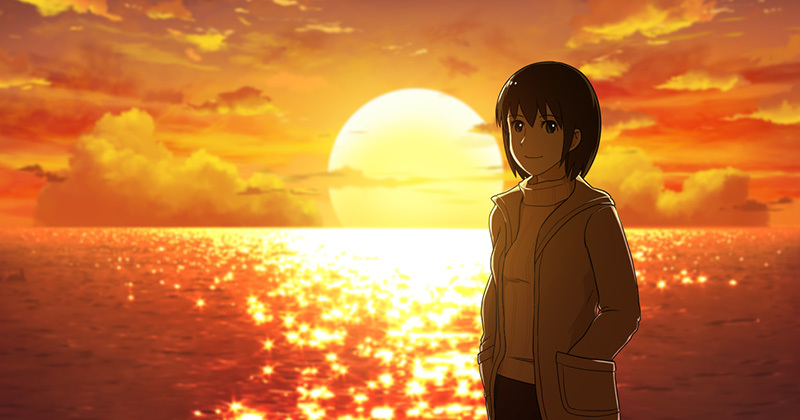 Compositing the effect on our anime background art is straight forward. We will be using multiple particle system for glitter effect and multiple fractal noise for wave effect. Generally, we will divide them into two groups, glowing and non glowing. 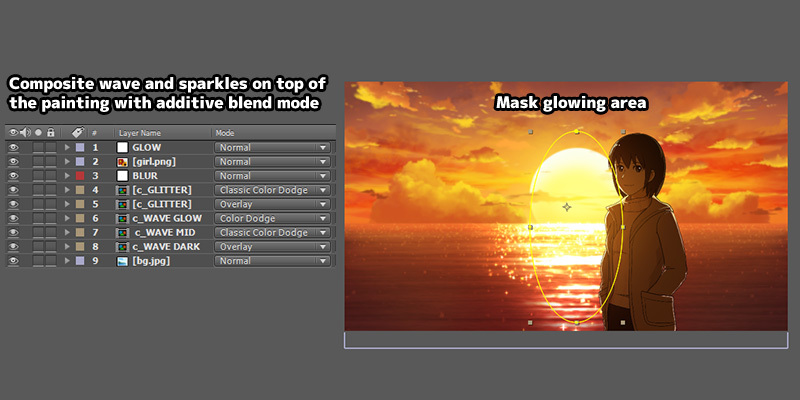 Use "Classic Color Dodge / Color Dodge" blend mode for the glowing glitter and wave. (area below the sun). This blend mode will give more colors compare to "Add" or "Linear Dodge". Use "Overlay" blend mode for the non glowing glitter and wave. For final touch, apply "Glow" filters and "Camera Lens Blur" filters for bokeh effect. 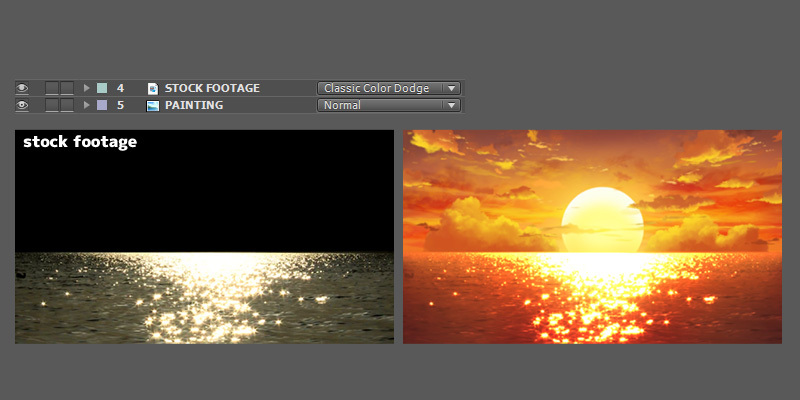 Aside of doing the effect manually, we can use stock footage to achieve the same effect easily. This method will actually look better a lot of time. So, take your camera with tripod and go to a nearby lake or sea to record some video. 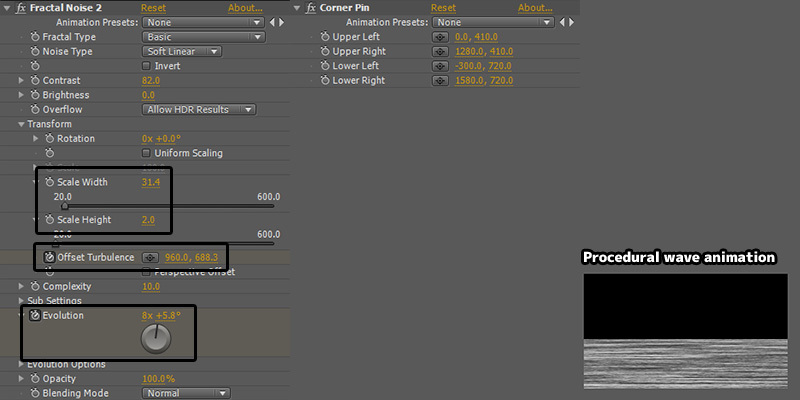 Then import the footage and Color Dodge blend them in AfterEffects. 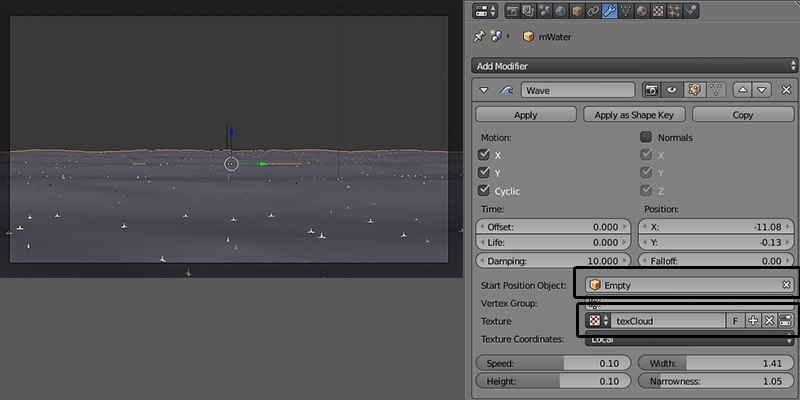 If you are a Blender3D user, you can achieve similar result too using "Particle System" and "Wave" modifier". Start Position Object - Add an "Empty" to the scene and use it as the starting position of the wave. Texture - Add a new texture for the wave displacement. In my case, I use "cloud". Remember to play with other settings such as "Speed", "Width", "Height" and "Narrowness". Number - Number of particles. 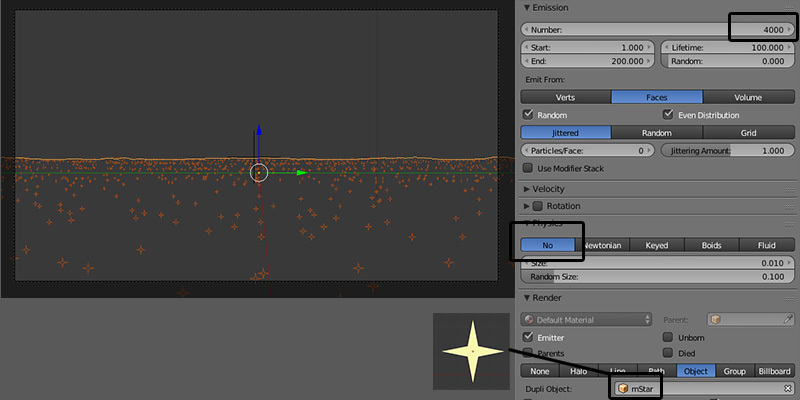 Render - Choose "Object", model a star mesh and set it as particle shape. The final result of anime water effect can be view in the following youtube video. 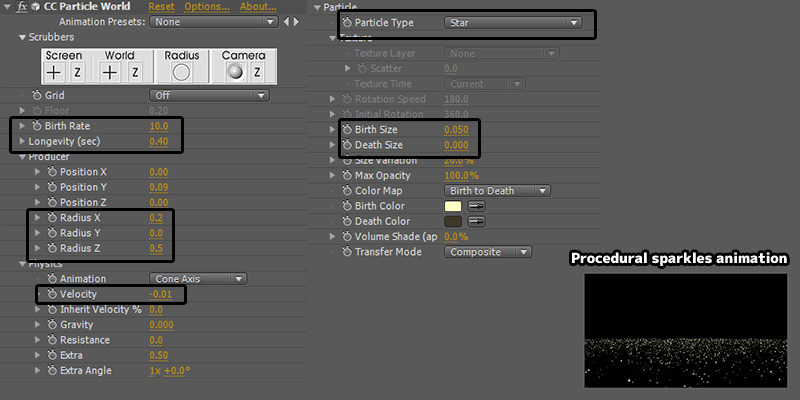 This method can be use in any other software with particle system, I believe you can even use it for game development. Is there a way to do this in clip studio? Thank you so much! You are amazing Mclelun sensei!